We are fast becoming witnesses to numerous LED monitors getting trimmer by the year, which is why we beg the question: how slimmer can these gizmos still get? Plenty more, it turns out. 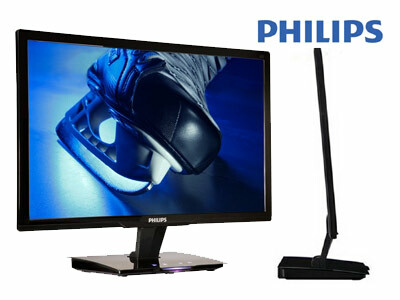 Enter the new Philips Blade LED Monitor. It has such an ultra slim design that makes its promise to deliver sharp colors seem like an impossible thing to do. We mean, where the hell will they tuck in all the supposed hardware in this anorexic beauty? Available in 21.5-inch and 23-inch screen sizes, you will find yourself staring into a 12.9mm chassis. The new range of Philips monitors use the latest generation Slim CCFL or LED, allowing designs to be much slimmer than its previous generations. The Blade has white LEDs that light up to full, consistent brightness, giving the screen a super high contrast ratio and superior color reproduction. Its Smart Contrast feature gives the LCD flat display the vibrant colors to your images. It also features the 2ms Turbo mode, a profile that turns on over the drive circuit for best response time is best of gaming or watching an action movie. It reduces jaggy edges so all the wham-bamming and the car chasing is served best. Also a Philips exclusive: the Smart Image technology, a user friendly interface that allows you to select various modes (Entertainment, Office, Image) to fit the application in use. It analyzes the content displayed on your screen and gives you optimized display performance. Another come-on is the Smart Touch controls – intelligent, touch sensitive icons that replace protruding buttons and responds to your lightest touch. Even the most complex of commands can be done by a finger’s touch. Philips has also committed itself to becoming more eco-friendly, and so they apply it to their latest creations. All plastic parts of the Philips Blade are made of 100% recyclable materials and the LED itself has very low power consumption during sleep mode. So yeah, this LED monitor’s slimmer, features are better, and colors are sharper. We say those are good grounds for an honorable placement in everyone’s living room.